• 100% of universities have women’s health services available on campus. • 100% of all state postsecondary schools have lactation rooms. • 97% of state colleges and universities offer online/hybrid classes. • 97% universities offer child care, usually including infant care, but the space in these facilities is limited, the waitlists can be long, and prices vary widely. • 87.5% have infant care. • 44% have family housing, but they can be pricey and the wait time is not published online. • 39.4% of all universities explicitly include pregnancy and parenting rights in their Title IX statements. • 31% of undergraduate degrees are available through the state online program. According to a September 2017 report from the Institute for Women’s Policy Research, only a minority of single mothers actually graduate. The number of single mothers in college more than doubled between 1999 and 2012 — that’s close to one in five of all women in college, or 11 percent of all undergraduates. They cite financial obstacles that got in the way, working full or part time, the cost of child care (and continued elimination of on-campus day care), and family housing. Women of color in college are especially likely to be single parents. After surveying the California state college and university websites, FFL recommends expanding the amount of child and infant care to reduce waitpool time, ensuring all pregnant and parenting students are aware of their rights and options, and expanding family housing options. FFL also recommends posting waitpool lengths online to be readily accessible to potential students and for pregnant women to be able to register for child care and family housing before the child is born. “Furthermore, we urge all colleges and universities to designate a central place on campus for pregnant and parenting students to inform students of resources and services, on and off campus. Policies, resources, and support should be readily accessible on the school’s website, shared during orientation, and throughout a student’s time in school,” Foster said. “To help build a supportive culture on campus, we urge administrators to update Title IX statements immediately to include support for pregnant and parenting students. Expanding online courses and degrees could also be helpful to those who cannot afford on-campus housing and child care, especially in California’s more expensive areas,” Foster concluded. Based on two decades of experience working with administrators, students, and community leaders, Foster recently authored FFL’s Recommendations for Best Practices to Serve Pregnant and Parenting Students to help for administrators. Students and administrators are also invited to take FFL’s Pregnant and Parenting Resource Survey(SM) to help evaluate their campus, which evolved over two decades of leading FFL Pregnancy Resource Forums across the country. 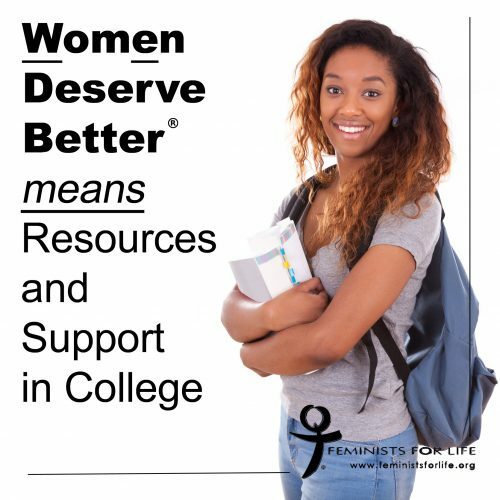 Student parents and counselors are encouraged to visit WomenDeserveBetter.com for help now. FFL’s full report on California State Colleges and Universities (including a link to individual school costs as of spring 2018) is available here. To book an interview with Ms. Foster regarding our report, Women’s History Month, or other issues, contact info@feministsforlife.org.